CLICK HERE to view a PDF version of the Ola Loa B-12 Supplement Facts suitable for printing. Ola Loa B-12 is sold in bottles of 60 dissolve-under-the-tongue lozenges, proved at $22.49. Ola Loa Cherry Flavor Sublingual B12 (HydroxyCobalamin) is the "mother" of all B12's. Typically this form of B12 is only available through a Nutrition Medical Doctor, and is the body's preferred form of vitamin B12—referred to as the "natural transport factor" for Cobalamin. Ola Loa's Hydroxy B12 provides greater absorption and better utilization than any other form of B12. Ola Loa's sublingual B12 is paired with the preferred form of Active-Folate (Folinic Acid) which work in tandem together. Ola Loa has been committed to providing the very best form of Vitamin B12 since we released our first product in 1999. We agree with many in the scientific community that no one should use Cyanide B12 (CyanoCobalamin), an inexpensive form is used in virtually all supplements that contain vitamin B12. Feel the difference Ola Loa's Hydroxy B12 makes and get the benefits of the best B12 on the market. Vegetarian diets - B12 is found almost exclusively in animal foods. Plants are not a reliable source of B12. Alcohol consumption - Excessive intake of alcohol in the diet is known to deplete B12. Digestive disorders - Celiac Disease and Crohn's Disease all deplete B12. Medications - Medications for diabetes or long-term use of acid reflux drugs; Stomach bypass surgery; Nitrous Oxide or "laughing gas" during surgery and unregulated Nitric Oxide are known causes of B12 depletion. Intrinsic Factors - A protein in the stomach allows the absorption of most B12, so if you have weak Intrinsic Factor you will not absorb much B12. WHICH VITAMIN B12 IS BETTER? Ola Loa Sublingual B12 (HydroxyCobalamin) is the "mother" of all B12's—typically available only through a Nutrition Medical Doctor. It is the body's preferred form of vitamin B12, and is referred to as the "natural transport factor" for Cobalamin. It provides greater absorption and better utilization than any other form of B12, and it's the form we use in Ola Loa's Hydroxy B12. Cyanocobalamin (Cyanide B12) is found in most B12 supplements because it is cheaper than other forms of B12. Cyanocobalamin is a B12 molecule bound to a toxic cyanide molecule. Too much Cyanocobalamin can be toxic. The Cyanocobalamin form of B12 is not used efficiently by the body, mostly excreted out of your body in about 5 hours. Methylcobalamin may interefere with the body's natural methyl transfer from folate to cobalamin resulting in impaired DNA replication. 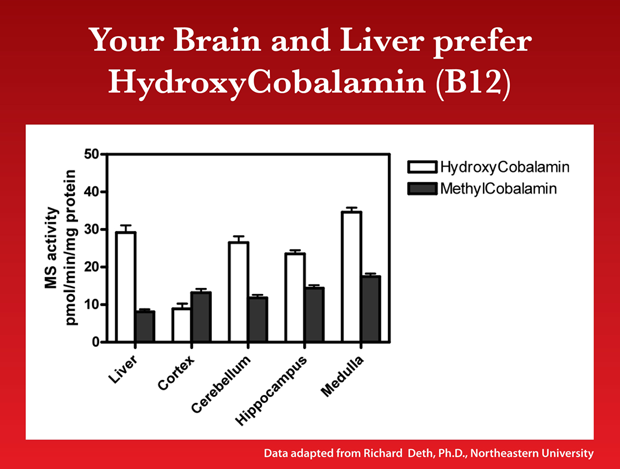 Hydroxycobalamin is not Intrinsic Factor dependent as is Methyl-B12. Hydroxy B12 can also bind to plasma proteins offering greater absorption and transportability, as well as increased availability in circulation. Hydroxy B12 is the only form of B12 which detoxifies Cyanide, Ammonia, Sulfite, and unregulated Nitric Oxide (which can become pro-inflammatory). Unregulated Nitric Oxide is, in fact, the hallmark of inflammation. Hydroxycobalamin is the only form of Vitamin B12 which can penetrate the Mitochondria. Hydroxy B12 makes more AdenosyCobalamin (the other active form of B12) than any other form of B12. Ola Loa Sublingual B12 (HydroxyCobalamin) is the "mother" of all B12's—typically available only through a Nutrition Medical Doctor. It is the body's preferred form of vitamin B12, and is referred to as the "natural transport factor" for Cobalamin. Simply stated,Ola Loa's Hydroxy B12 provides greater absorption and better utilization than any other form of B12.